The walled fortress at Helm's Deep is under attack by the mighty Uruk-hai army. The forces of men, elves, and a dwarf must do everything they can to stop them from breaching the fortress walls. Can they prevent the Berserker Uruk-hai planting the bomb and blowing up the wall? Will they stop the enemy climbing up the siege ladders? The people of Rohan have never faced such a deadly threat! Includes 8 minifigures: Aragorn, Gimli, Haldir, King Théoden, Berserker Uruk-hai and 3 Uruk-hai. Launch a surprise attack from the hidden door! Repel the enemy with the catapult! Climb the tower and blow The Horn of Helm Hammerhand! Combine with 9471 Uruk-hai™ Army and build up your army for even greater battles! When rumours first started floating around the internet about a potential Lord of the Rings theme, there seemed to be a collective excitement at the potential it could offer. With the Hobbit series being filmed, renewed interest was being pumped into the Middle Earth franchise as fans began to speculate. Once images became available it really was difficult not to be excited. Looking over this set, there was so much to like; a large, expansive and excellently designed set that is iconic, a bunch of minifigures (and some exclusives) and a lot of playability functions. The fact that the 9471 Uruk-Hai Army set could be added on was only icing to the cake. Lego could easily have added it all in and increased the price with no complaints, however this would give consumers a cheaper alternative to acquiring Uruk-Hai for an epic battle scene. Castle, Kingdoms and Lord of the Rings fans alike all sought this awesome set. First of all we have three, dual faced Uruk-Hai. The standard Uruks all have the same designs, though variation can be created by alternating which face, armour and weapons are used per minifigure. The standard Uruk-hai are available in 3 other sets; 9471 Uruk-Hai Army, 9476 The Orc Forge and 10237 Tower of Orthanc. There is also a polybag (30211) which contains a standard Uruk-Hai with armour and ballista. Next we have one Uruk-Hai Berserker minifigure. It is unique to this set. I thought the face print was a touch disappointing, and the Berserker was significantly larger in the movie than other Uruk-Hai. It would have been nice Lego came up with a larger design; similar to the Azog minifigure given away at Comic Con, but it is also being picky. Onto our heroes and the first minifigure we look at is Gimli the dwarf. This minifigure is also available in 3 other sets; 9473 The Mines of Moria, 79006 The Council of Elrond and 79008 Pirate Ship Ambush. The second "hero" minifigure we look at is Aragorn. This minifigure is also available in 2 other sets; 9472 Attack on Weathertop and 79008 Pirate Ship Ambush. This Haldir minifigure is only available in this set. It comes with a cape and a very nicely detailed front print, all ready to go to war. Finally we have this King Theoden minifigure that is also only available in this set. The print on his armour, helm and legs are fantastic and really well done. Theoden also has this generic horse model which can be found in other sets. So for our money, we receive only 3 exclusive minifigures which is a bit disappointing. The minifigures we do get though are incredibly detailed with excellent designs. As we look further into the parts, it would be remiss of me to not mention the stickers, or more importantly; the lack of. The set contains 6 stickers in total, with 4 being applied to the outer wall of the Hornburg. Outside of that, we have one banner and one sticker for a detailed throne. It actually would have been nice for Lego to include at least another banner for custom improvements as there are plenty being used throughout the scene as opposed to having one hang in the hall. The design is simply excellent. I also would like to point out the disappointment in the Uruk-Hai armour not having the hand print designs. I understand Lego's marketing behind it, but it is disappointing that the hand prints were limited to the Orc Forge and Orthanc sets, especially considering how large and expensive this set is. First thing we get when we open up our box is A LOT of bags. The build is split into 9 stages spread over the four instruction booklets. The build can be challenging at times, specifically due to the temporary flimsy nature of the walls until they are secured with plates. On a few occasions there was some cursing as I applied too much pressure only for my build to crumble before my eyes. The interior walls and Hornburg both decided to blow up unexpectedly during my build. It will require a bit of patience, which is why it is aimed at older Lego enthusiasts. This set is absolutely packed out with playability features for everyone and little nods to Lords of the Rings fans. The curved ramp leading to the front gate has a hidden skull. This can also be used to display the final desperate charge by King Theoden and his Rohirrim to buy their women and children time to escape. The front gate opens, as well as the wooden planks above it move to allow attacks onto the Uruk-Hai below. There is a small catapult next to it, though it is an additional Lego feature as it wasn't used in the movie. Lego have built in this side door, where Aragorn and Gimli sneak out to blindside the Uruk-Hai attacking the front gate. Next to it we have this small setup which enables us to fling Gimli across onto the marauding pack! The Deeping Wall has a culvert where our Berserker lights up a bomb with his torch. Just like the scene in the movie, the wall here can "explode" sending rubble everywhere! This is a very neat feature built into our wall. The throne room has a nice interior though the wall panelling needed improvement, large pieces for the windows take away from the design and make it seem more plainer, compared to the interesting exterior wall design. The room is fleshed out with an interesting throne and other features, plus the awesome Rohirrim banner previously mentioned. As we can see, the Battle for Helm's Deep set contains many features that will continue to ensure this set will highly sought after. Going by the sold listings, the eight minifigures total $48.26, with the current asking prices totalling $61.71. When we consider our full retail price of $129.99 and that we are left with over 1300 pieces, it is a fantastic return. Let us not forget the majority of investors will be acquiring this set at discounted rates, increasing its value for money even further. As we can see by the price per piece ratio, Helm's Deep is an actual improvement over the larger sets of other themes, but at a cost; a couple of extra minifigures. It would have been nice to include another couple of minifigures, particularly generic elf warriors to flesh out the battle scene. That being said, we do get a lot of value for our purchase and it certainly isn't a disappointment! The Lord of the Rings novel was released in three volumes from 29 July 1954 to 20 October 1955 and is the second highest selling novel in history with an estimated 150 million copies sold. The three movies combined for nearly $3 billion in box office receipts. Lego is not only still creating Lord of the Rings set, but basing sets on the series predecessor "The Hobbit" as well. This set is the flagship for the first wave, and one of the most iconic scenes throughout the trilogy. The Lord of the Rings theme currently has a 4.93% CAGR. Considering it is a brand new theme with few retired sets and a raft of discounts now available, that is actually a decent return. One only has to take a glance at not only castle style sets such as Kingdoms and Castle, but popular fantasy themes such as Harry Potter, to see that this set has a very bright future. This set was released in May 2011 and is still currently available. It was available in many stores and easily accessible to consumers though being a high price ranged set can price it out of many Lego fans' budgets. It currently is scheduled to be discontinued by the end of the year. As we can see, the front box art is very clear, showing off the display in all its glory. The minifigures feature prominently without taking anything away from the design. The back of the box details the interior of the design, as well as all the playability features on offer. The larger boxes do stand out, though typically in my local stores they are displayed on the bottom shelves. The cardboard used for the box is not thick, and like most Lego sets will be susceptible to creasing and shelfwear over time. It would be nice if Lego used the sturdier designed boxes such as the 4207 City Garage more regularly. Still, from Lego's perspective, most of these sets are made to be opened immediately and not stashed away. As we can see, sets based on Castles as well as flagship sets for popular themes have a great history. Considering this (and the current price reductions for this set) it would be pertinent to acquire this set for investment portfolios. This set is iconic and features one of the most well-known scenes in the Lord of the Rings trilogy. Considering the quality of the next wave emerging, it is saying something that this set still continues to be one of the greatest in the theme. It is not unrealistic to expect great returns on this set as it ticks many boxes towards success once it has gone EOL; iconic, exclusive minifigures, great theme and large set. For mine, this one is a no-brainer. This set is certainly eye catching, and on display will promote conversation from anyone walking into a room. There is enough detail, through the curved walls, battle scene environment to the Hornburg and the culvert in the Deeping Wall. Even the most casual Lord of the Rings fan will not fail to automatically recognise this design. My only real complaint is that I would have preferred it be two or three bricks taller, as it does seem a touch short (especially when the Uruk-Hai could probably stand on each other's shoulders to get over!). If we add on the 9471 Uruk-Hai army set, we get just a bit more icing to an already delicious cake. It is a fantastic display with many features automatically recognisable from the massive battle in The Two Towers. Lego have produced an excellent portrayal of the Battle for Helm's Deep, creating an iconic design with great detail. The set has many features automatically recognisable and enthrals Lego and Lord of the Rings fans alike, bringing in fans outside the Lego demographic. With plenty of pieces it makes the set profitable to part out as well as captivating those building the sets for themselves. The set contains 8 minifigures, a horse and an impressive fortress. The set could definitely have used another minifigure or two, as well as a touch more height with the walls but that is nit-picking as we have been given an amazing set. If investors cast their eye back to the 4842 Hogwarts Castle, 10217 Diagon Alley, 4195 Queen Anne's Revenge or 4184 Black Pearl, they will remember how these sets were discounted towards the end of their run and next minute they were gone; culminating in a soaring price ever since. I believe this set will do the same and that those people who do not have it in their portfolio will regret it sooner than they might imagine. Buy one, buy ten but no matter what do not miss out! In June 2012, many a hour I wasted staring out my bedroom window, eagerly awaiting the arrival of the 9474 Battle of Helm's Deep I ordered. For about a week, each time I saw the UPS truck head down my street, I would run down the stairs, ready to gleefully recieve the set. Apparently, I didn't do my research properly because the set arrived rather by the postal service. It's probably obvious by now that my interest in Lord of the Rings Lego is massive, but during this review I will try to spare you from fanboy gushes and provide proffessional insight into the set and its investment potential. Note that I said "try". Battle of Helm's Deep is the largest set of the first Lord of the Rings line at 1368 pieces and retails for 129.99 (US). The set was the most anticipated of the Lord of the Rings line being iconic in nature, and massive in size. Depicting the epic conclusional battle of the second movie, the set is likely to perform excellently after EOL. The set is large, impressive, and makes a stunning first impression. The set contains 1368 pieces and 8 minifigures and is filled to the brim with parts that will bring castle lovers to a drooling mess. 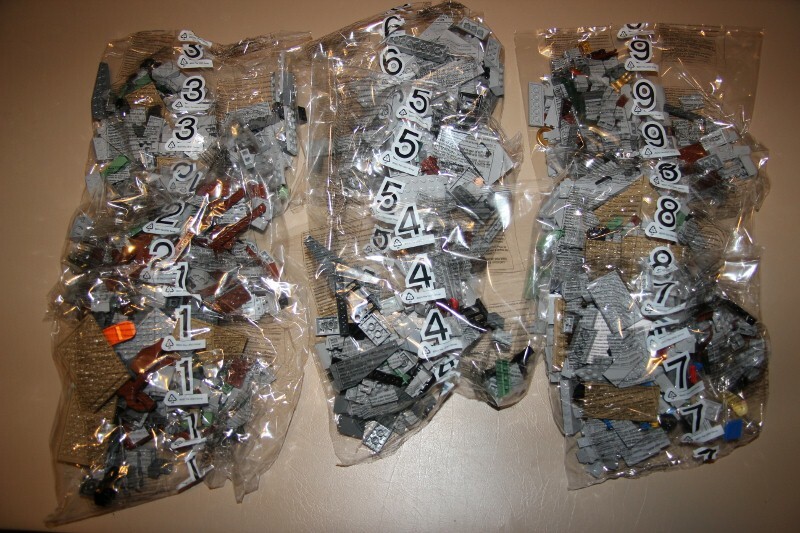 Looking at the inventory, the set could easily be mistaken for a grey parts pack with hundreds of grey bricks and plates making up the bulk of the set's pieces. Unfortunately, other than the minifigures, no exclusive parts are included. The set does however, have a ton of useful pieces such as the new horse in brown, a brick seperator and variety of different dark tan plates. Ultimately, the lack of exclusive pieces is forgotten in the shear number of them, and one set is a sizeable piece addition to even weathered MOCers. All the grey pieces will help attract classic castle lovers. The set has eight minifigures, three of them exclusive to the set. Two armoured Uruk-Hai and a Uruk-Hai scout are included, making up the core of the attacking army. Now it makes sense that Theoden said, "is all you can conjure, Saruman? ": the set is in desperate need for more minifigures and doesn't have a very good price per minifigure ratio (see chart below). A beserker Uruk-Hai featuring a printed grey head and bare chest is included, which is suprising because I would think that a monsterous beast blowing himself up is a bit heavy Lego material, but as a collector, I'm not complaining. Aragorn and Gimli both feature great printing, but are included in other sets. Haldir and Theoden really have a lot of work put into them including front, back, and leg printing and are some of the best licensed minifigures I have seen. This chart represents the set's price per minifigure ratio, sort of like price per piece but with minifigures. I compared it to th other Lord of the Rings sets to see which is the best value. The chart shows a large spread between minifigure values, and reveals that 9474 Battle of Helm's Deep has the worst minifigure to price ratio, over three times more than that of 9471 Uruk-Hai Army. The set makes up for its bad price per minifigure value by giving us high detail on the eight minifigures that it does come with and a huge brick selection that will impress castle MOCers and beef up even large collections. Since the walls of the castle are brick built, (which by the way will please castle fans) and the castle is mostly symetrical the build can be repetitive at times. However, that must be expected with any set over 1000 pieces and is the repetitiveness is forgiven by the increasing feeling of epicness that grows with every brick. The set's parts fit together with technic pins and are spread out over 4 instruction booklets, so the set is dying to be built with friends and family while watching the Lord of the Rings movies. Interestingly, the minifigures are distributed among different bags so if you are building with other people, almost everyone will get to make a minifigure. The build starts with the gate which is beautifully brick made (no premade gate pieces here) upon a rock bed that surounds the castle. The side of the gate features a small door for Aragorn and Gimli to sneak out (accurate) and a catapult to help them jump the distance to the causeway (not so much). The build is very brick intensive, but is broken up by little details that will keep you interested. The build for the wall section is unsteady, but purposely so as it is made to "explode". Overall, the set offers a fun build but if it is too long, the four instruction booklets can accomadate for multiple buildiers at the same time. As a owner of several other Lego castles (unfortunately no classic castles, though), I can say this set offer quite a bit of playability for the theme. What the set lacks for in the feel of having an enclosed fortress it makes up for it with an exploding wall function, secret door (although that is pretty standard for a Lego castle), rock and dwarf catapults, large tower and throne room complete with a table, golden utensils and a medieval drumstick. As per every Lego castle, the set features a host of weapons and two weapons racks. While a bridge between the inner an outer battlements makes the set more accurate it also makes it hard to use the area between the first and second walls. A Uruk-Hai seige ladder is included and makes up for the lack of a battering ram. The licensed minifigures may help give kids ideas for play, but the Uruk-Hai do not come in a great enough amount to give the defense of the castle an outnumbered hopelessness (nothing a few Uruk-Hai Army sets won't fix). The set ranks as an above average castle for playability, but could be better, as the designers sacrificed extra playability functions for movie accuracy. The set packs in a lot of features and building techniques, but at times can feel bland. Taken as a whole, the set is a great playset and building event while remaining accurate to the source material and will delight children and adults. The set offers stunning value as a parts pack (1368 pieces), and the includes eight licensed minifigures. The chart below compares its value to the other Lord of the Rings sets. While Helm's Deep has the worst PPM ratio, it makes up for it by having the second best PPP ratio (after 9470 Shelob Attacks). The set's huge amount of pieces make you feel that you are getting you money's worth, and the set is a great value for castle builders. While the finished product us perhaps not the largest Lego castle, it is brick built and features few panels so feels very thick and real. Beyond the "tangibles", the set offers great value in terms of the design of the set, which is refreshing, interesting, and varied. The curved walls make the set unique and give the set a clean look. As a display piece, the set is excellent value. For those looking to part out the set, initially its nearly average PPP ratio seems to make the set not an ideal choice. However, the set has many licensed minifigures and accesory pieces that will raise the price value. Below is the approximate values of what you can get for each minifigure based on recent eBay sold listings. Once you sell the eight minifigures and the horse, you are left with two selling options. You can sell the whole thing by itself, listed as the set with "no-minifigures". Based on maket prices, you should be able to sell the set without the figures for about 80 - 90 dollars giving you a total revenue of $139-149 (profit: $9.01-19.01). The second option, while more time consuming, can lead to more revenue. If you can manage to sell the set's pieces on a part-out website such as Bricklink averaging at 11 cents per piece (which is doable considering the generous amount of larger pieces, but will be easier if you find the set for cheap), it will result in a subtotal of $144.65, total revenue of $203.65 (11 cents x 1315 pieces) and total profit of $73.66. The set's massive piece count speaks for itself and will leave you satisfied for what you get. The Lord of the Rings theme has performed solidly in retail but has yet to be tested in the aftermarket. However, as the sets are backed by a large fanbase of movie and book fans, the theme's future looks bright. Its popularity can only go up as the Hobbit movies attract new fans to the theme. Lord of the Rings is quite popular among AFOLs as the builds are detailed and contain useful pieces. The set sits as the flagship of the first wave of the theme, and is a must-have for anyone interested in the theme. I predict that the theme's performance in the aftermarket will surpass that of Harry Potter, but perhaps not that of Indiana Jones, mostly because Harry Potter sets have to deal with a wide variety of remakes that lower the demand for a particular version, while the Indy line has a comparable set number right now. Both Indy and Harry Potter are backed by popular movie sequences and are a good indicator for LOTR's sucess. Overall, the Lord of the Rings theme is bound for great things, and being the flagship of the theme's first line, 9474 Helm's Deep is sitting in a good posisition. 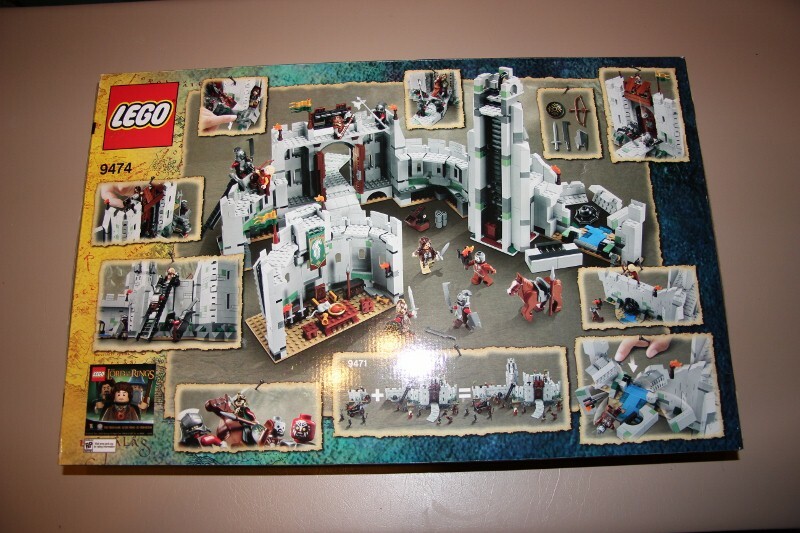 While the set is not a Lego or retail exclusive it is generally harder to find compared to the other Lord of the Rings sets because it is large and thus less produced, and is a faster seller. The set is currently (April 29/2013) availible for less than retail at Walmart, Target, and Amazon in the US and is availible for MSRP at several other retailers. Another thing to keep in mind is that 9474 is set to retire this June (based on rumours and the release of a second line at that time) meaning it will have only had a one-year run. That factor will help reduce supply in the aftermarket. If you are looking to get this set for a deep discount, closely watch department store clearance aisles in the coming months. Most retailers have a pattern of slashing prices to make room for new stock in June/July but if you find it for a shallow discount and feel it won't go any further, jump on it. The set is packaged in a large box and feels heavy for its size. The box shows the set in its movie atmosphere with rain falling down onto the valley walls in the dark of the night. The front scene on the box helps make the set more recognizeable and may help entice casual buyers. The packaging features the navy to yellow banner that is featured on all Lord of the Rings sets, with the finger of Sauron indicating the set is from the first Lord of the Rings line. The back of the box has "parchment" pictures of the sets features. Overall, the box has excellent graphics that are typical to the Lord of the Rings line that can only help the set's later performance. To analyze this set's growth potential I will compare it to other sets, look at what it offers and what could go wrong. Since the set is the set is the largest and most iconic set of a particular licensed wave (LOTR), I am going to liken it to several other licensed flagships (I did not include the Star Wars license, as that theme has evolved into almost an "evergreen" theme). In order to be compared in this chart, a set had to be the largest set of its line, iconic for its fans, EOL so we can see its aftermarket performance, and from a popular license (sorry, Prince of Persia). Don't take 9474's current negative CAGR as a bad sign. Plenty of sets like 4184 Black Pearl had near-retail values until they retired. As the chart illustrates, flagship sets of popular licensed themes perform spectacularly in the aftermarket and 9474 The Battle of Helm's Deep has enough to offer that it will likely not stop that trend. I believe that it's aftermarket performance will be similar to 4842 Hogwart's Castle in the long run as both are backed by huge movie and book fanbases and both are in the same sort of "fantasy" niche. Also, both Harry Potter and Lord of the Rings have D2C sets: HP has Diagon Alley and LOTR will have The Tower of Orthanc. In terms of a head to head between Helm's Deep and future D2C Tower of Orthanc, I would be inclined to say that both will provide virtually the same return as that is what occured with Diagon Alley and Hogwart's Castle; both sets have a CAGR of 19%, so the real determining factors will be amounts stored by investors. For the Lord of the Rings theme as a whole, I predict returns in between those of Harry Potter and Indiana Jones, with a couple sets potentially even passing Indy sets' stellar performances. Other than its status as the flagship of a popular license, Helm's Deep has several other factors gunning for its success after it EOLs. Firstly, the set has eight licensed minifigures, three of which are exclusive that will help the set perform after its EOL. The exclusive figures, Theoden, Haldir and the beserker Uruk-Hai are important to the storyline of the films (Theoden much moreso) and feature great front and back printing that make them must-haves even for casual Lord of the Rings Fans. The other five figures can only help the set further. Second, the set has a great piece selection at 1368 pieces, and all the grey pieces make the set an essential parts-pack for castle builders. Large sets typically perform well in the aftermarket, with few exceptions (8078 Portal of Atlantis, at 1007 pieces is the only one that comes to mind). The huge amount of useful bricks found in the box will help entice non-LOTR fans into paying aftermarket prices for the set. Third, 9474 Battle of Helm's Deep is not only part of the popular Lord of the Rings theme, it is also probably the fourth most iconic Lord of the Rings location (after the two towers and minas tirith) making it vital for collectors. It's equivilant of Star War's X-Wing, Harry Potter's Hagrid's Hut, and Indiana Jones' Ark Chamber. It's iconic nature challenges similar-sized licensed flagships (see chart above) and will also lead to raised prices. Before I make a price estimation, I have to look at the bad. Not many things can go wrong with the set; sure it could have used a couple more minifigures and have a better PPP ratio but those ultimately won't affect the post-EOL price by much. My biggest fear for this set is that it lacks the one investing element that really made Cafe Corner a winner: scarcity. The set isn't an exclusive and while it is harder to come by than say, 9471 Uruk-Hai army, it is still widely availible and more than that, is becoming more and more a mainstream investing option. I don't believe that this set will be over purchased to the point of doom like Home One Mon Calimari Star Cruiser, but it is being horded pretty good by some investors. Remember, the key factor that makes retired Lego a good investment is high demand and low supply. Applying the above valuation factors, I hypothesize that 9474 Battle of Helm's Deep will become a soaring investment once it retires, due to its iconic status backed by a large movie and book fanbase, high piece count and exclusive minifigures. Past perfomance of iconic license sets further backs up the evidence that this set is bound for greatness. The set should achieve a CAGR of ~20% once it retires and I estimate it has a ceiling of $400-$500 dollars max. Holding on to this set at least until the last Hobbit movie is released will bring generous profits. Helm's deep is perhaps the best castle for display with its imposing, curved brick built walls that contrast greatly with the typical Lego castle that features prebuilt panels (Helm's Deep only uses 8 of them) and a square shape. The castle's unique shape makes it more interesting to look at then "traditional" castles and it is versatile; it can be a proudly displayed piece of Lord of the Rings paraphenalia or a quick change of flag colour can make it a base for non-licensed factions. Sand green bricks and brown accents break up the grey of the set making it easier on the eyes. Visitors to your collection will be intriguiged by the set's curved walls and unorthodox design, and the inner throne room (which is fully loaded with furniture, weapons racks and banners) will only keep them looking longer. The slit windows are much better integrated than those in 9471 Uruk-Hai Army on the inside, and doors look fantastic. Diehard LOTR fans may find the proportions of the set to be a bit off from the movie, but for the sake of playability and price, the set is fine as is. A number of AFOLs have taken to modifying the set to make it more realistic to the movie and have documented their quests online. I have posted a link on the bottom of this section to one that I find is especially helpful in seeing how the set can meet the needs of those looking for a movie accurate portrayl. If you want to enhance the display without really modifying the set, I would suggest purchasing two Uruk-Hai Army sets and connecting them to the deeping wall. This gives the full castle and wall a length of 95 studs which means that the set will fit perfectly (one stud is left empty) on two X-large light grey baseplates. The two baseplates give the set a more complete look, letting you pose the minifigures on the studs and completely contain the whole castle minus a tiny bit of the causeway that escapes off the plate. Overall, 9474 Battle for Helm's deep offers high display interest and is the jewel of the Lord of the Rings Collection. The curved walls give the castle a unique and advanced look. The set is pure eye candy and its powerful and recognizeable design will help raise aftermarket prices. The set offers a distinct and detailed Lord of the Rings model that is instantly recognizeable to even casual fans. Offering solid playablity and a stunning amount of bricks, the set is a great value especially if you can find it on sale. The Lord of the Rings theme and accurate design of the set will help propel it in the aftermarket. Investors should expect above average returns as the set is the flagship of a popular license, and collectors should expect an awesome set that will leave them oozing more than ten thousand good things to say about the set. With the release of 9474 The Battle For Helm's Deep, Lego has conjured a model that is accurate, imposing, and flat-out amazing. Battle of Helm's Deep is the largest set from the LOTR first wave of LEGO sets, and the most impressive and iconic as well. The scene it depicts is one of the most remembered ones from the books and movies, and to be honest it represents it very well. This model comes with 8 minifigures and a horse. The highlights of the minifig selection are Theoden and Haldir, who are exclusive to this set as of this point. These two characters play an important role in the LOTR story, and if they are not re-released on another set in the future they could very easily make 9747 a lot more valuable. I would assume that eventually we will get another Theoden minifig, just because how iconic he is, but I'm positive this is the only set that will include Haldir. The rest of the figures are pretty common, with 3 regular Uruk Hai, the Berserker Uruk Hai that helps breach the wall, Aragorn and Gimli. Unique parts don't seem to be a feature of this model, since it mostly consists on pieces utilized to construct the outer and inner walls, as well as the tower. This however does not detract from the set, especially because of the minifig selection and the iconic nature of th scene itself. There are some nice details with some kind of green pieces that make the walls look more realistic and contrast a little bit with the gray pieces. I would categorize the build as experience as slightly above average. 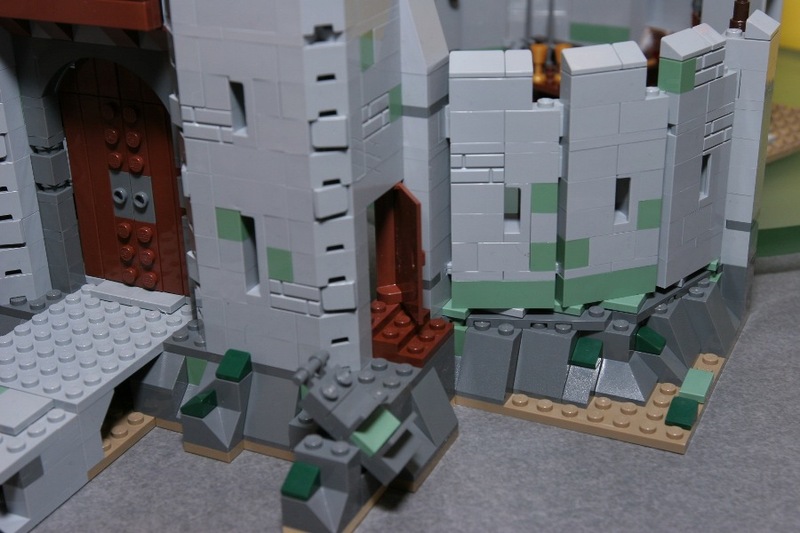 It is a fun build, but bear in mind that you will spend most of your time just building walls with grey bricks that can turn out to feel a little repetitive. The tower helps break some of the monotony, and the inner wall section does that as well. The most interesting sections to build quite honestly are the play features. This set is a playset, not l "merely" a display piece, but it performs both roles really well. The highlight of the set is the wall the Uruk Hai army blows up to breach the walls, since once built there is a sort of "switch" that permits you to perform that very same thing yourself. It is a pretty fun feature, and you get to see the wall blow up in your own home and then pick up the pieces and easily reconstruct it. Some other notable things are the small catapults that are set above the walls to shoot the "projectiles", the main door that can be opened or closed and the step where you can get Aragorn to throw Gimli over the Uruk Hai and take them down. There is also a nice ladder where you set the Uruk Hai to appear as if they are climbing up into the fort. Important to note here is there is another set sold separately that enhances Helms Deep with one extra wall and some nice figs, most notably Eomer and a Rohan soldier. Will the play features enhance the value of the set in the future? in this case I would say yes. Having the wall blowing up is probably one of the most easily recognized scenes of the Battle of Helm's Deep, and that would certainly hold its appeal as more collectors/investors decide to acquire the older LOTR sets. The three sets listed above share some similarities among them. All of them what I consider to be "castle" style sets, have similar number of pieces and price points as well. Even more, the 4842 Hogwarts Castle is also a very popular licensed theme and was assigned a MSRP that matches exactly the one for Helm's Deep. So, as you can see the Battle of Helm's Deep has a price per piece that is in line with what I would considered comparable sets. This makes me think that the set was fairly priced from the beginning, taking into consideration that Hogwarts 4842 shared a very similar amount of minifigs, with some of them being exclusive to that set as well. Now, having a price per piece ratio that is consistent with that of comparable sets does not make this set a bargain by any means, it just suggests that is fairly priced. However, we have to remember that the set has been heavily discounted for long periods of time, usually staying around the $ 110 to $ 115 range that would bring its price per piece ratio to approximately $ 0.08. At that point I do think we can talk about this set giving you a great amount of value for the money, when we consider the currently exclusive minifigs and the iconic scene it's representing. Based on raw numbers, it would appear that this set is a good candidate for parting out, especially if bought at a discount over retail. However it is important to note that there have not been many sales of Helm's Deep loose structures over the past few months, perhaps as a consequence of deep discounting. It would be wise to think very well before attempting to part out considering that you may end up getting stuck with the Helm's Deep structure and not able to make a profit on the whole venture. The Lord of the rings theme's popularity has yet to be proven when talking strictly about Lego products and their performance on the secondary market, but I think is pretty safe to say that given its overall popularity in pretty much every other aspect, the license will add considerable value to the sets produced under it. As an example we already have the Harry Potter sets. Those sets have performed extremely well in the secondAry market, especially the last few sets that were released and retired not long ago. In my opinion, HP gives us an estimate of what we can expect to see with the LOTR theme once they start goin EOL. Even more, I would argue that the LOTR theme will be even more popular than the HP sets, considering that the franchise has been around for a longer time, during which it has accumulated a large fan base that keeps growing day by day as more people watch the movies and read the books. While the HP theme is similar in popularity, it's lasting impact will only be determined once enough time has gone by, while The Lord of The Rings has nothing to prove since it has been popular over a long period of time already. Anyway, it is a pretty safe assumption to say that the LOTR theme will perform at least as good as the HP sets, with a high probabiltiy that it surpasses it. If we take into consideration that, as of today 4/25/2013, the CAGR for the Harry Potter theme sits at a very respectable 16.32%, then we have a lot of motives to be optimistic about the LOTR theme as a whole. This set is not exclusive to any store, and it also is not in limited production. The set has been readily available since its launch on several different retailers. The only thing that may in some way be considered an special aspect for 9474 is that, if some information is correct, it will be retired without having reached the traditional 2 years most LEGO sets spend on the market. In some way, this may end up benefitting investors, since shorter production runs usually translate in less supply, driving up prices once the set is retired if there is enough demand for the set. The packaging for this set is mostly average. There are no really special factors that make the box stand out other than the Lord Of The Rings and LEGO brand. As most sets, the graphics displayed on the packaging are very appealing, but not something that would stand out on the shelves where there are dozens of other sets displayed. The box size is pretty standard for the amount of pieces as well, so again not really something that stands out. In my opinion, the growth potential for this set is above average. Let's first look at the closest example that has been recently retired and then get into some of the other details. As said before, Hogwarts Castle and Helm's Deep can be considered similar sets of similar themes. Both are very iconic structures from the movies, have close to the same amount of pieces, same price per piece ratio and same retail price. Furthermore, both themes are very popular, with several books and movies to confirm it. Hogwarts Castle 4842 was retired just a few months ago and has alrady shot up in value, with a CAGR of 19.79% that will probably be mantained until the end of the year. If we base our comparison on the similarities between both sets, and even more on the fact that Helm's Deep will probably have a shorter production run than Hogwarts, we can expect it to achieve at least as good as a return as the HP set. So, assuming the sets dissapears from the shelves by the end of the year, this time next year we should be talking about a gross profit of close to $100.00, assuming the set was bought at retail to begin with. That is close to doubling in value!, something that would probably happen in a couple of months after that. The path the Harry Potter castle takes from here to the end of the year could provide us with more insights about what we can expect Helm's Deep to sell for by holiday season of 2014. First, it is the largest set of the currently produced or announced of the Lord of the Rings line. With more than 1,000 pieces this set should follow the trend of the big majority of large LEGO sets. It is really hard to find a set with over a thousand pieces that has not performed well in the after market. Second, we have a popular licensed theme that is set to continue to produce material with the release of The Hobbit trilogy. Licensed themes usually perform very well in the after market, and Harry Potter has proven that the returns may be higher than we anticipate. Even more, this set has some currently exclusive minifigs that are very important on the series context, like Theoden, who if not released again will help propel the value of this set even higher. Finally, every single Lord Of the Rings fan or collector will need Helm's Deep to have a collection that is considered complete. The scene is just too important to not have, and this same thing is a reason why even regular LEGO collectors that do not need to have every single LOTR set that is produced will consider this set to be the only one they just can't permit missing on. As I said before, despite the fact that this set has as a primary objective to be a playset, it turns out to be a great display piece as well. The size is just right for it to be a center piece of a small collection, and it is very detailed for the amount of pieces it has to begin with. The minifigures and play features enhance the looks of thise set if properly placed, since they help to bring the actual movie scene to life. Coupled with set 9471, it just looks even better than it does by itself. In conclusion , I would rate this set as an above average set, with great potential to be an investment winner in the near future. Don't be caught without at least one, or you will be remembering how many investors are still wondering how they could have missed on the Harry Potter boat.